An Exhibition on Lesser Known History: Chagall, Lissitzky, Malevich: The Russian Avant-Garde in Vitebsk, 1918–1922 | The Bottom Line "The Drawing Center"
Currently on view at the Jewish Museum is the first major exhibition on the art movement at the turning point of Russian history, and on a lesser known chapter of art history: Chagall, Lissitzky, Malevich: The Russian Avant-Garde in Vitebsk, 1918–1922. Organized by and first exhibited at the Centre Pompidou, Paris, the exhibition presents a selection of works by faculty members and students at People’s Art School, a vibrant yet short-lived educational institute intended for all established in 1919 by Marc Chagall (b.1887, d.1985). A narrative of passion and hope is told through artworks, spotlighting how a group of talented forward-thinking artists attempted to create new world views with experimental forms of art as they welcomed a new age for their country. The exhibition takes up the second floor of The Jewish Museum, starting from a bright orange wall that vibrantly illuminates the premise of the show. The simple yet clear introductory wall text brings the viewers to post-revolutionary Vitebsk (today in Belarus), where Chagall and his contemporaries began a modern art movement that transformed into social action. The exhibition is separated into four well-connected sections: “Post-revolutionary Fervor in Vitebsk;” “The People’s Art School;” “The ‘New Art’: Lissitzky and Malevich;” and “Collective Utopia.” With different focuses, these sections chronicle this brief but lively time when artists experimented and collaborated in a free learning space. The artists planted their political ideas in their works of art, challenging the status quo with newly invented art forms. The three artists spotlighted in the title are not entirely the focus of the exhibition. In fact, the exhibition offers a broader understanding of the art movement of which they were all a part. 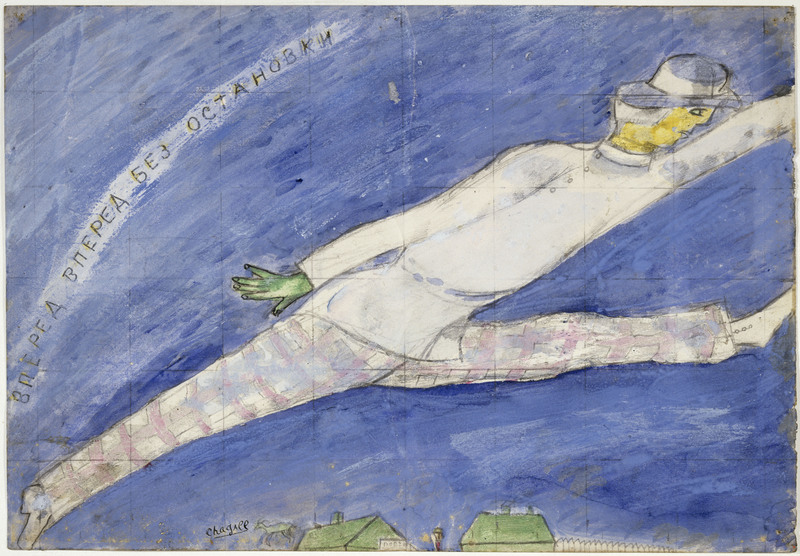 Following the clear flow of the exhibition, the viewers are able to comprehend why Marc Chagall was inspired to establish a school that offered accessible art education, how students and faculty’s works flourished collectively toward an abstract form of expression, and how Malevich seized the opportunity to promote his ideology through the forming of an activist artist society with his pupils. A major theme captured in the exhibition is a post-revolutionary zeitgeist of change in art that was made possible by an educational environment. The exhibition not only introduces a specific chapter in art history but also tells the story of what accessible art education and freedom of expression in art can do. The work being produced in Vitebsk between 1918 and 1922 is not dissimilar to what we know as activist art today, and the story told here is indeed a moment in history about art as activism. 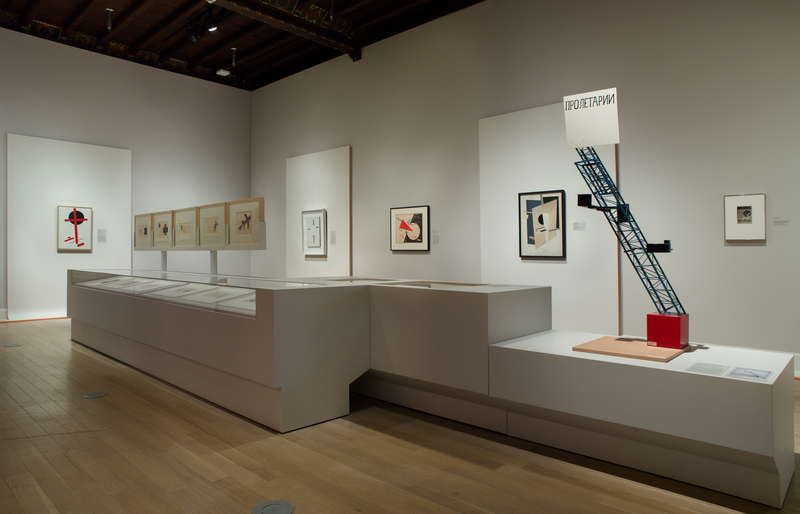 Through a segmented but connected way of telling history, the exhibition invites the viewers to appreciate the vibrancy and social relevance of the Russian avant-garde. In a way, this exhibition truly mirrors its content by exercising easy-to-follow language to audiences less savvy in art in the guiding texts that demonstrates what The People’s Art School attempted to do. That is, to welcome people into a seemingly unfamiliar world and allow them to be inspired. The exhibition embarks on its storytelling with a holistic sense of time. A clear overview from the wall text brings the viewers to post-revolutionary Vitebsk. The year was 1918, and Russia was about to celebrate the first anniversary of the Revolution. It was a time of drastic socio-economic and political change, and an overall future-facing sense of hope permeated the society. The viewers are introduced to Chagall and his joyful news of finally receiving official citizenship and marrying his wife Bella (nee Rosenfeld). As the Commisar of Arts for the city and region of Vitebsk, Chagall was responsible for decorating the city for its anniversary celebration. However, he wanted to do more for his beloved city. In his conviction to offer art education to underprivileged youths, Chagall opened The People’s Art School in 1919. Responding to a larger societal desire for new ideas, he recruited artists of diverse styles and backgrounds to teach and collaborate, including the other two highlighted artists, El Lissitzky and Kazimir Malevich. 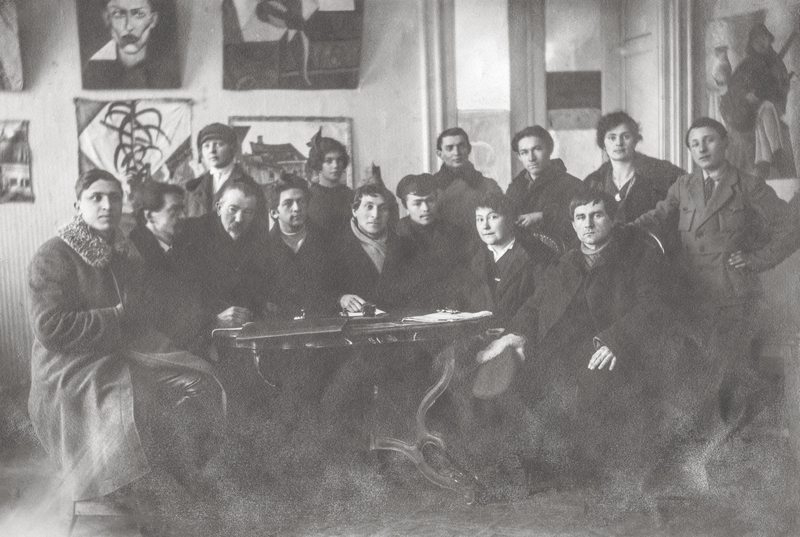 Members of the Creative Committee of the People’s Art School, Vitebsk, winter 1919. Seated: Yuri (Yehuda) Pen (third from left), Marc Chagall (center), Vera Ermolaeva (second from right), Kazimir Malevich (right). Gelatin silver print. Archives Marc et Ida Chagall, Paris. From the selection of artworks in this exhibition, viewers can easily pick up on a great sense of diversity and subsequent stylistic shift. 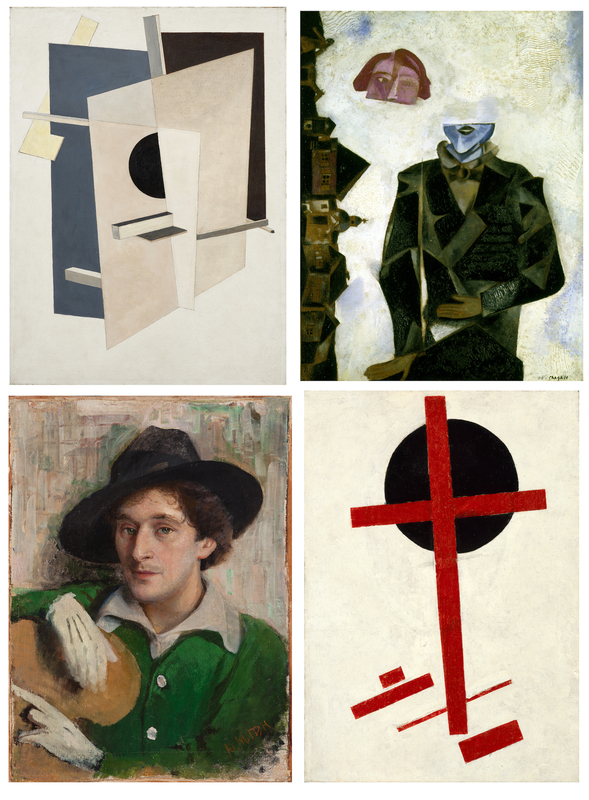 From the realistic Portrait of Marc Chagall by Yuri (Yehuda) Pen, to Chagall’s paintings of semi-realistic elements, Lissitzky’s geometric drawings, and Malevich’s abstract work of Suprematism, the exhibition contrasts styles that demonstrate how artists at The People’s Art School were inventing their unique modes of expression. Aside from offering a clear outline to this fast-evolving chapter in art history, the exhibition also juxtaposes artworks and their creators’ ideologies. Art was not merely art; but a vehicle on which ideas, hopes, and desires for a new world were broadcasted. This is made especially clear by the highlight on Kazimir Malevich and the emphasis of Suprematism in the third section of the exhibition. With works of multiple media and of geometric shapes displayed across the gallery, a change in this atmosphere is palpable. The vibrant diversity that Marc Chagall had intended for his school had shifted to an intense focus on abstraction. 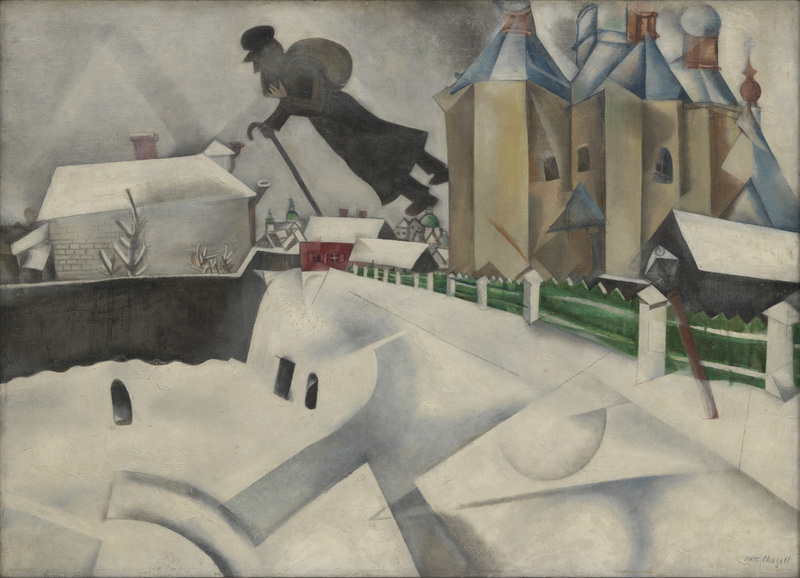 This was partly because Chagall appointed Malevich as his succeeding director in early 1920. Malevich’s style of Suprematism evolved from Cubism and Cubo-Futurism, and this charismatic artist and teacher was leading his students to pursue his style with great productivity. Finally, the viewers are introduced to the last section of the exhibition, “Collective Utopia.” In 1920, the creative activist group UNOVIS (Utverditeli Novovo Iskusstva, The Champions of the New Art) was established under Malevich’s guidance. 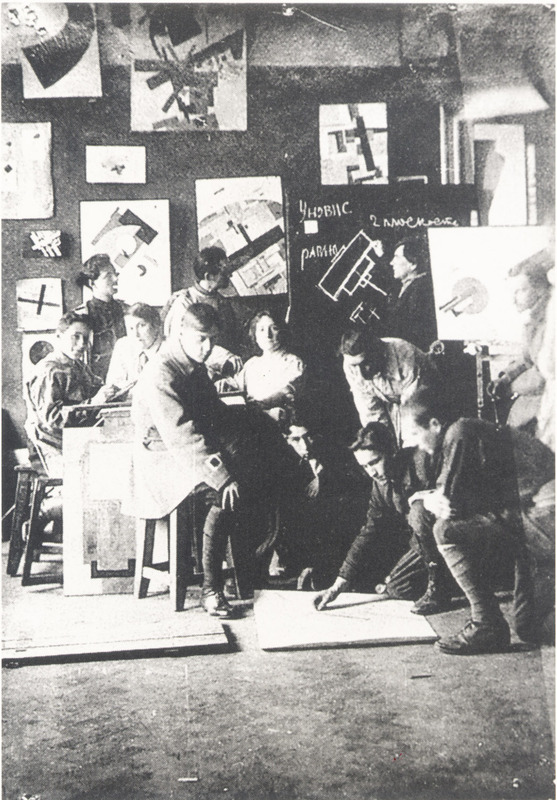 This self-selected teacher-student alliance worked primarily with Suprematism to embark on a cultural project. They designed posters, magazines, banners, ration cards, tram cars, and painted geometric forms onto buildings. The mission of this creative group was not only to make work; they were actively treating drawing and art as part of the actions to change their world. Chagall’s conviction to offer accessible art education to working-class youth was a kick-start for the Russian avant-garde movement. The People’s Art School in Vitebsk provided absolute liberty for teachers of diverse styles to not only teach but also explore with their students. The exhibition showcases Suprematism to highlight the vitality of creativity and activism. In its accessible ways of telling history and showing art, this exhibition tells a story of great social relevance today. The exhibition simultaneously mirrors its content in showing what contemporary art and art education still do: give voice to people through art, and encourage discussions and thoughts with their individuality and faith to make change. 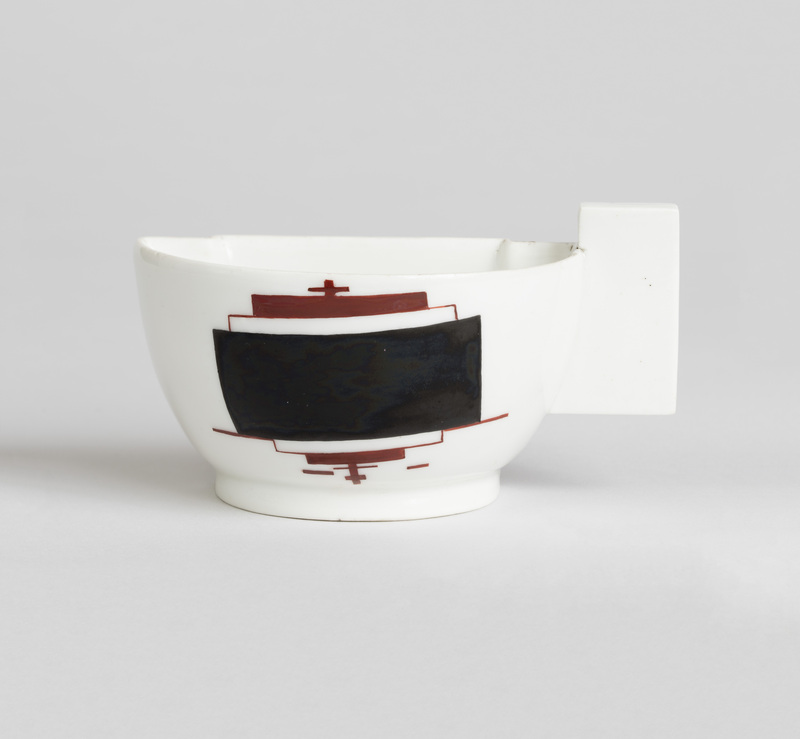 Chagall, Lissitzky, Malevich: The Russian Avant-Garde in Vitebsk, 1918–1922 was organized by exhibition curator Angela Lampe, Curator of Modern Art, Musée National d’Art Moderne, Centre Pompidou, Paris, in collaboration with Claudia J. Nahson, Morris & Eva Feld Curator, The Jewish Museum, for the presentation at The Jewish Museum. The exhibition is on view until January 6, 2019.